On openframeworks class, we learned how to make a tree from stalk, stem, branch to leaf. To make it more interesting, I referred to some related materials, expecially some math method to draw different shape. So I try to use rotating triangles to create sunflower, but unexpectedly by changing some parameters it turned out to be cactus. I also change the color and the amount of cactus to simulate the four seasons of trees, using direction keys right, down, left, up for standing for spring, summer, autumn and winter. Random function is the amazing methods which can produce some incredibale visual effects, and the most interesting part is that you always happen to create something fancy by chance and they are usually unpredictable. So I wanna try to explore several random functions and some different combination by using processing, to create some interesting. 1. I tried use random() for color filling, both for all kinds of shapes and for background. 2. I tried to combine random() with trigonometric function(sin(),cos(),tan()). 3. I tried another interesting random function called noise(). Since the basic principle to program the programmable paper is by using magnetism, in some cases electrically programming is not the only way to rewrite the content on paper. 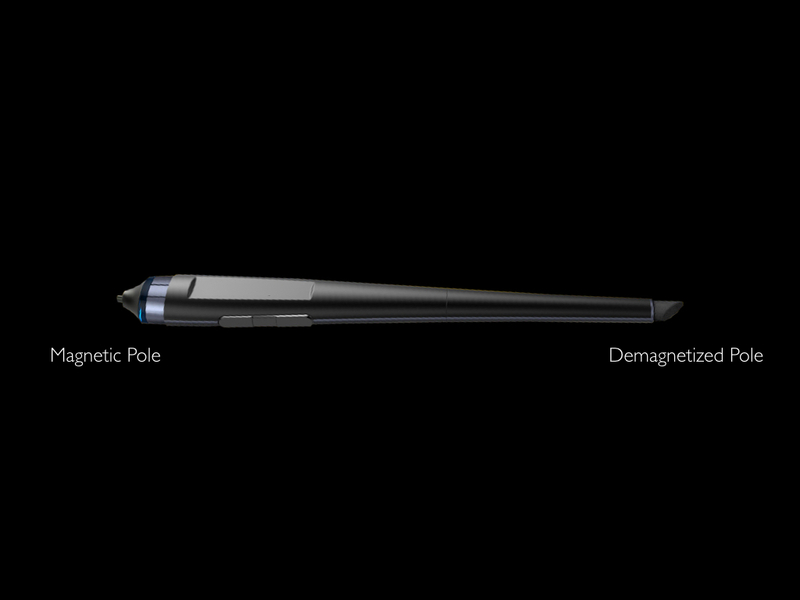 The nib is consisted of magnetic pole, and the eraser is consisted of demagnetized pole, where we can use the attraction and exclusion of magnetism to write or erase on programmable paper. The experience is as good as we do with pencil and real paper. When we review the war between e-book and paper book, what we should focus on is not how people feel bad about them, but their advantages. As for paper book, someone said that“I love how they smell. I love scribbling in the margins, underlining interesting sentences, folding a page corner to mark my place.”. As for the ebooks, it is obvious, you can put the whole library into your pocket. So regardless of their respective disadvantages, how can we make full use of and combine their great advantages. I think the essential part of the whole picture is paper. Human have invented and used paper for about 2000 years, so that we are used to using paper products. And on the other hand, ebook reader could offer some benefits that paper doesn’t own. So I was trying to think about inventing a new type of paper, programmable paper. We know that the way we program hardware is by using electricity, and display cannot work without electricity neither. So in some way, I want this programmable paper to get rid of the dependence of electricity by using magnetism. There should be countless invisibly tiny magnetic poles, which are randomly arranged between positive and negative electrodes. These tiny magnetic poles are actually the pixels here. So the way we program paper is that by programming the electric field, which generates a changing magnetic field, which program the position of the magnetic poles. I’ll go with more details. So when we charge the electrodes, they become a parallel-plate capacitor(positive charges accumulate on one plate, with negative charges on the other), which generates electric field between them. So if we change the direction or strength of the electric field, it generates magnetic field with different direction and strength. So that we can use this changing magnetic field to control the movement of the magnetic poles. So, when we plug in the electrodes, the program we write would control the magnetic poles to display whatever we want. Since the position of the magnetic poles are determined every time we program it, it get fixed even if we remove the power supply. So it becomes quiet easy and convenient to use, works just like paper without battery. I thought of the inconvenience when we are reading or taking notes on ebook reader. Like iPad, which is trying to simulate the real experience when we are reading a paper book. But it could easily cause eyestrain(eye fatigue), and the coldness of machine may sometimes make people feel uncomfortable. While kindle would offer better experience by using e-ink display, it still doesn’t solve the problem of reading habits of paper books. And there are some common problems for which these ebook readers can not provide good solutions. 2. When we are reading books, we are used to read over some early pages, and skim through the later pages. This is very important for us to build connection while reading, but it is not easy to do so on these devices. 3. We usually take notes on paper books, underline some words paragraphs, make some marks, draw something or write something. But the notes are usually separate on paper, so we may need to organize them together, excerpt some parts and even edit them later. So I made a super simple prototype, it is basically another kind of ebook reader. The video below shows the thinnest and most flexible type of e-ink display developed by Sony, and I am gonna apply it for my product. Im gonna use 4 pieces of this display to make up 2 screens, each with two pieces on both side. And the front and back covers consist of flexible glass, which work as multi-touch panel when you close the cover with one side of screen. And these two covers can only work together with front or back display, or they are just pieces of glass. On the main display interfaces when u are reading, you can slide the interface to go to next two pages, or slide to go back to former two pages.So if you want to read over some early pages, close the main reading pages, the front displays will show all the early pages. Hover your finger on any page, it gives you the detail. You can use this function to look through quickly, and choose the page you wanna reread. Similarly, you can also skim through later pages by using back display. Alright, so if you close the front cover, the glass become multi-touch interface, it will show the book cover, zoom out and u get the bookshelf. It would be easy to choose any book you want. So when you are reading on main pages and want to take some notes, say underline some sentences, highlight some words, make some marks and write something. Anytime you close the back cover, it will pick up and display all the notes you made, you can review them and edit. And sometimes you may wanna read more detail based on your notes, you can just click the notes, it will get you back to the corresponding page. We are used to taking notes on paper notebook, but sometimes when we refer to notes just only find that everything on notebook is in a mess. For our better understanding, it seems that everything needs to be reorganized in a better structure. However this is not easy to do so by rewriting them again either on notebook or on computer. This situation happened to me so many times before. So I think of making something that can transfer my notes on paper into notes on the screen, that is to transfer the physical notes into digital notes. So I made a simple prototype to demonstrate my idea. This device is basically made up of two parts, the board is used to record the handwritten notes, and the box covers the circuit inside which is used to process the notes and communicate with the apps on mobile devices. So we can put either paper or notebook on board, when we write something on it, the notes we take will show up on the app.